I am reading and obsessing over all things French these days. The French have carved a niche for themselves with their class, culture, and most importantly, their exotic cuisine. A pivotal part of the French haute cuisine are the herbs. Along with a distinct flavor, each herb imparts a beautiful balance to the creamy courses. Using greens like thyme, chives, parsley, cilantro, tarragon, rosemary, licorice, and basil can either make or break a dish. And one such herb this article deals with at length is chervil. Also called the French parsley, chervil is used widely in cooking. But what we know very little about are its therapeutic uses. Curious? Go on and scroll down! Chervil (Anthriscus cerefolium) is a delicate annual herb that belongs to the parsley family. It has finely divided, fern-like leaves and tiny, white flowers that form clusters. Chervil leaves have a subtle flavor and delicate scent – like a combination of tarragon and fennel. This subtle taste is what makes chervil a part of the ‘fines herbes’ – an indispensable blend of herbs popular in French haute cuisine. The Romans popularized this herb, and it is now used across Europe. Like its Apiaceae family members (cumin, coriander, dill, etc. ), chervil is used in folk and ancient medicine to cure many disorders. Read on to find out what they are. Chervil is used along with dandelion, rosemary, red clover, and white bean to regulate weight loss. It is used to formulate the KEMEPHY (Ketogenic Mediterranean with Phytoextracts) diet. This diet is a combination of Mediterranean and very-low calorie ketogenic diets. Phytoextracts are added to counter some commonly reported side effects of the ketogenic diet. This diet requires you to consume about 90-100 g of protein, 34-74 g of carbs, and 50-60 g of fat in variable amounts, every day over six weeks. This combination of herbs and veggies has amylase-inhibitory effects – where the starch is not broken down for energy. Αlpha-amylase is a pancreatic enzyme responsible for carbohydrate metabolism. In other words, it controls the digestion (or breakdown) of starch and glycogen. Inhibiting amylase can decrease the availability of glucose, starch, and simple carbs in the blood (1). In the absence of starch (carbs), your body resorts to using fats and proteins (ketones) for energy. The protein satiety leaves you with reduced appetite, bringing about weight loss (2). 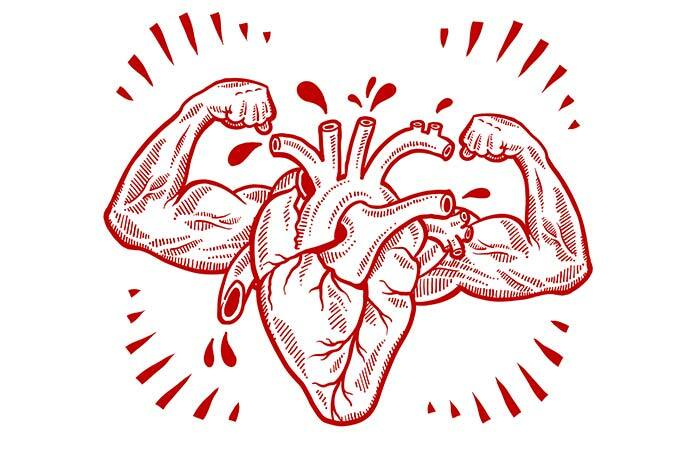 Impaired availability of nitric oxide (NO) in your vascular system can lead to cardiovascular diseases. This can be prevented by adequate nitrate and nitrite molecules. The best sources of nitrite and nitrate are the vegetables in your diet. These include chervil, celery, watercress, radish, beetroot, spinach, and Swiss chard – 100 grams of any of these veggies contain more than 250 mg of inorganic nitrate. This nitrate is converted to NO and effectively prevents cardiovascular ailments like atherosclerosis, ischemic attacks, angina, and hypertension (3). Ancient folk medicine used members of the Apiaceae family to cure GI tract issues. 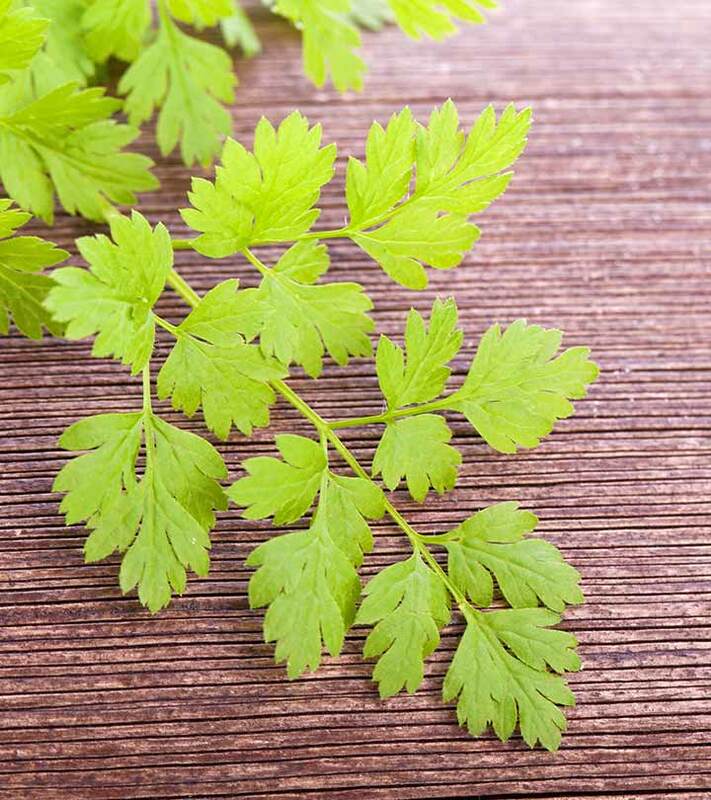 And according to the Iranian traditional medicine, a wild chervil root infusion can treat stomach ache, cramps, and hiccups. Chervil leaves, just like parsley,cilantro, and celery, can be used alternatively to aid digestion and prevent hyperlipidemia (4). For an herb primarily used in the French and European cuisines, chervil is less known and studied. Though it may have fewer benefits than other herbs, chervil has great nutrition value. Its leaves and roots are rich in micronutrients, coumarins, and other antioxidants. Take a look! Chervil is an abundant reserve of calcium, potassium, vitamins A and C, folate, riboflavin, pyridoxine, magnesium, and phosphorus. 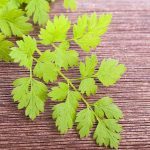 Wild chervil essential oil has trans-β-farnesene (27.5%), trans-β-ocimene (20.9%), β-pinene (2.8%), limonene (12.0%), spathulenol (8.6%), and myrcene (1.3%) (5). These are potent antioxidants and anti-inflammatory agents. Thanks to the nutritional and phytochemical profiles of chervil, it became popular with the French. And not just the French! After knowing its benefits and nutritional values, chervil would be every foodie’s love! True, isn’t it? 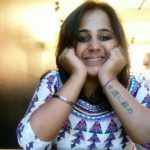 And what does a good foodie do? Cook up a storm and eat! That’s what I did too! While at it, I’ve gathered some surprises for you. Go ahead and scroll down! In a large mixing bowl, put the eggs, spring onions, and herbs. Beat them together lightly. Heat a medium-sized frying pan over medium-low heat, add a quarter of the butter and melt until it begins to foam. Pour in a quarter of the egg mixture and swirl to cover the base of the pan. Stir gently for 2-3 minutes or until the mixture is almost set. Add a quarter of the smoked salmon strips and cook for a further 30 seconds or until it sets. Fold over and quickly slide onto a serving plate. Repeat to make 2-3 more omelets. 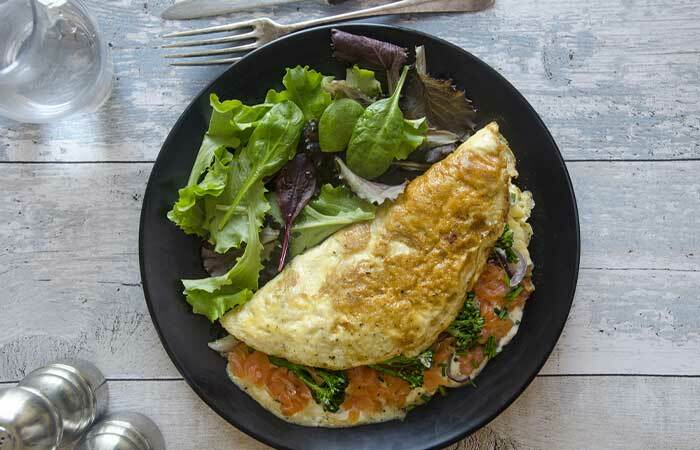 Serve each omelet hot with salad leaves and a dip of your choice. To a medium-large saucepan, add the chicken stock and the stems of chervil. Bring them to a boil over medium-high heat. Reduce the heat to a simmer. Cover the saucepan and cook until the stems are tender, or for about 8–10 minutes. Strain the stock through a sieve or a muslin cloth, discarding the stems. Add the stock back to the pan and keep it warm. Meanwhile, in a food processor, add the chervil leaves, heavy cream, parsley, egg yolks, salt, and pepper. Blend all of them thoroughly for a smooth purée. Transfer the mixture to a bowl. Slowly whisk a cup of the warm broth into the yolk mixture. Then, whisk the remaining broth into the purée until you obtain a smooth mixture. Serve hot-warm along with some fresh, toasted bread slices. 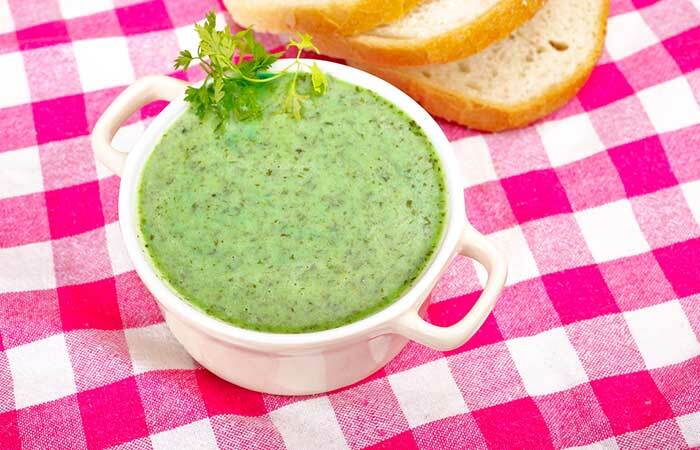 As it travels from the esophagus to your stomach, enjoy the creamy, mild, herby, bittersweet chervil – totally at its best! Hope you loved this gastronomic sojourn from the stove to the stomach. Chervil makes you go weak in the knees with its delicate flavors. But if you are one of those that dislike chervil in food, you can happily substitute it with either parsley or tarragon. It would be tough to notice the difference because that is how similar chervil, parsley, and tarragon are – in terms of taste and flavor. Chervil @ Home: How To Grow Chervil In Your House? Sow the seeds of chervil plants into their permanent container. (OR) Start in the biodegradable seed starting pots that can go directly into rich, organic soil. Plant the small seeds shallowly. Keep the soil moist but not soggy to avoid the seeds rotting or damping off after germination. Expose the soil to medium sunlight to soft and hazy mornings. Chervil plants reach 12 to 24 inches in height. You have to clip the new growth on the top of the plant frequently. Clippings of the plant are best when used fresh. If the plants seem to spread too fast, decrease sun exposure and move the container to a cooler location. You can plant tarragon, parsley, and chives as a company to the chervil plant you’ll have the ‘fines herbes’ all grown fresh at your home! Note: Wild chervil (Anthriscus sylvestris), the twin of this garden chervil, is a much-dreaded weed. These weeds can increase the photosensitivity of your skin and hence cause rashes. So, beware and choose the seeds carefully before you plant them. Yes. Add the seeds to your kitchen garden. You can see the little white chervil flowers smiling at you in no time! It’s a robust crop with a range of applications – both in and out of the kitchen. You can start a tiny garden with these seeds. You can buy them here. Most of the plant parts – the roots, stems, leaves, and sometimes the flowers – are used in either cooking fine dishes or curing various disorders. Buy the dried chervil leaves here. So, this time, try adding chervil to those salads, soups, or pasta. You will then understand why the French have given chervil an indispensable place in their cuisine. Hope you liked this read and are ready to absorb the goodness of chervil. Let us know how you liked the recipes. Share your feedback in the box below.